Sinusitis and Asthma: What’s the Connection? Sinusitis and asthma symptoms may be connected. Nearly half of individuals with moderate to severe asthma also experience sinusitis. Experiencing sinusitis on top of asthma can be difficult to manage when the symptoms leave you feeling sick and miserable. If left untreated, symptoms can worsen and even result in more severe cases of asthma. If you’ve experienced a combination of sinusitis and asthma, you’re not alone. Learn more about the link between these two conditions and how to treat them. When the lining of your sinuses (the small cavities around the nose) become inflamed, this is referred to as sinusitis. As your sinuses become inflamed, they can fill with mucus and the drainage tracts can become blocked. The condition can last for days-to-weeks (acute sinusitis) or for three months or more (chronic sinusitis). Acute or chronic sinusitis can be caused by allergies, viral infections of the upper respiratory tract, bacterial infections, fungal infections, smoking, or a compromised immune system. Asthma is a chronic disease causing inflammation in the airways. An asthma flare-up or asthma attack can happen at any time. While mild symptoms may only last a few minutes, severe symptoms can last for hours or days. According the American College of Allergy, Asthma & Immunology, there is a link between chronic sinusitis and asthma in some people. Both asthma and sinusitis may be triggered by inflammation to an allergen or irritant. In addition, postnasal drip caused by sinusitis may trigger coughing arising from the throat which can aggravate asthma symptoms. Chronic sinusitis can sometimes be associated with allergic conditions such as hay fever. An allergic response can cause drainage channels to become blocked and result in an infection or inflammation in the sinuses. How Are Sinusitis and Asthma Treated? Treatment for sinusitis can depend on whether the condition is acute or chronic and the root cause. Acute symptoms due to a viral infection typically go away on their own within a couple of weeks. Decongestant and other over-the-counter medications can help clear the airways and offer relief of headaches. If symptoms persist after 10 days, it’s best to see your doctor. If your doctor suspects a bacterial infection, you may be prescribed antibiotics to clear the infection and reduce the inflammation. An allergy specialist can help determine if you have underlying allergies or asthma that may be contributing to your symptoms. Allergists can also assist by developing a better management plan for your asthma, including preventive treatment, can help reduce inflammation and persistent symptoms. Work with your asthma specialist to develop a treatment plan to prevent and reduce asthma and sinusitis symptoms. Don’t let sinusitis or asthma get the best of you. Contact the Allergy & Asthma Specialists of North Florida to schedule an appointment and develop an effective treatment plan. Compared to the rest of the U.S., midwinter and early spring in Jacksonville is a really beautiful time of year. Although, our mild temperatures tend to attract folks from more frigid regions, that doesn’t mean our “cool” seasons are completely free of any downsides. In fact, if you’re allergic to tree pollen — one of the most common allergens we have here on the First Coast — you know this all too well. Another downside? Jacksonville was amongst the Worst Cities for Spring Allergies in 2018 at #51 in the US (although, on the bright side — that is a slight improvement from the previous listing where we were #50). Across most of the country, trees don’t release their pollen until early spring. But, thanks to our temperate climate here in North Florida, local trees usually start producing an abundance of pollen starting in early February (but that could start as early as December). And the pollen season in 2019 is expected to come early starting in late January. If you suffer from tree pollen sensitivity, here’s a helpful guide for tree pollen allergies and our best advice for controlling a reaction this spring season. When spring is in the air, we know allergy season is fast approaching. The warmer weather causes plants to bloom and release pollen into the air. If you suffer from seasonal spring allergies, you likely experience symptoms starting in January and lasting through May. Occasionally, tree pollen shows up earlier in pollen counts so it’s important to prepare for spring allergies before the peak season begins. Don’t wait until allergy season to get prepared. Whether you make an appointment with an allergist now or start taking allergy medications, plan in advance for spring allergies. If you haven’t been allergy tested, now is a great time to do it. Use the following seven tips to be proactive with allergies this spring. Don’t wait for allergy symptoms to start before making an appointment to see your allergist. Be sure to schedule your appointment before tree pollen appears in February, sometimes as early as January in Florida. An allergist can run tests to confirm the causes of your allergies and prepare a treatment plan to keep you feeling your best. Your allergist may recommend antihistamines or other allergy medications to help you combat the spring allergy season. You should start taking medications around two weeks before you typically experience allergy symptoms. Antihistamines help block or reduce histamines which cause allergy symptoms. Getting the medication in your system early can help ease or reduce a stuffy nose or itchy, watery eyes. If you need treatment beyond mediations, allergy shots (immunotherapy) can desensitize you to bothersome allergens over time. These treatments typically take a few months before patients feel relief but can offer lifelong relief of allergy symptoms, resulting in a significant decrease in medication use. Grass and tree pollen are the biggest allergen offenders during the spring. Allergy apps for your smartphone or tablet can help you keep an eye on daily local pollen counts. In addition, keep track of the days when your allergies are worse to help you plan. Mid-morning and early evening are peak pollen hours. It’s best to stay indoors on days when the pollen counts are high. When longer days bring more daylight streaming through your windows, it’s easier to notice the dust and cobwebs that took over during the winter. Spring is a great time for allergy sufferers to deep clean their entire home to remove unwanted dust and pollen. As tempting as it is to fling open the windows and let the fresh air inside, keep them shut during peak pollen season. A fresh, spring breeze will likely bring pollen particles with it. Keep windows and doors shut in your home and your car to avoid pollen exposure until levels decline. It’s recommended to change the air filter on your HVAC every three months to keep the air inside your home clean and fresh. It may also be time to change out the HEPA filter on your vacuum. Don’t forget to consider other products around the house to help decrease exposure to allergens such as quality mattress covers and allergen-friendly pillowcases to reduce dust mites and prevent allergies. Spring’s humidity also brings high quantities of mold spores in bathrooms, kitchens, basements, or any areas with high moisture. Check under sinks, around bathrooms, in closets on outside walls, and under the doormat. Clean and remove any mold and keep an eye on humidity levels in your home (below 50% recommended) to keep mold from returning. Repair any leaks and make sure areas have proper ventilation. Are you ready for spring allergies in Jacksonville? Schedule an appointment today with the Allergy & Asthma Specialist of North Florida to make sure you’re prepared. Call us today at 904-730-4870 or request an appointment online. Allergies or asthma can make us feel miserable. But when combined the results and symptoms can be much worse. Indoor and outdoor allergies impact over 50 million Americans with a wide range of triggers. Asthma affects 1 in 13 people and causes the airways inside the lungs to constrict and narrow making it difficult to breathe. 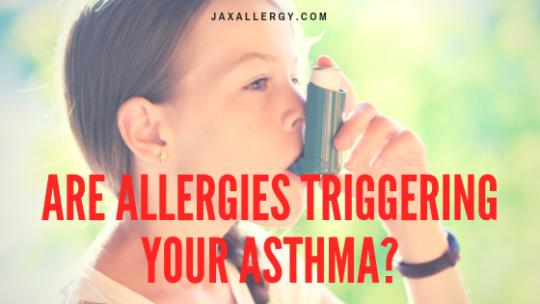 Allergies and asthma are the two most common chronic diseases in the United States, and they occur together more often than many people realize. In fact, allergic asthma is the most common type of asthma, according to the Asthma and Allergy Foundation of America. In Florida, allergy season begins as early as January when trees begin to release their pollen. The allergy season continues through summer and into the fall with grass pollen, ragweed pollen and molds. These allergens can trigger asthmatic symptoms in people allergic to them. If you struggle with allergy and asthma symptoms, read on to learn more about how these two chronic diseases can be related and how to treat the symptoms. With pumpkins everywhere and stores filled with Spiderman costumes, it’s almost time for what may be kids’ favorite holiday — Halloween. Their excitement, however, is tempered by parents’ caution about their children’s safety. For parents of a child with allergies, the concerns are even greater. Many schools and daycare facilities host Halloween parties, which can be especially stressful for parents since you’re not there to protect your children. In addition, younger children don’t have the awareness to say no to certain types of candy or give in to the temptation to have the same foods their friends are enjoying. The keys to a stress- and allergy-free class party includes partnering with the teacher, class parent or other school staff member. If you’re unable to volunteer to help or be present on party day, find out who the party host will be and coordinate with him or her in advance about your child’s allergy and any action plan that may be needed to respond to an allergy emergency. If you can be involved in the party planning, you can encourage a focus on non-food related activities, such as crafts, little toy bags, a scavenger hunt, or Halloween games. Food will likely be part of the festivities however, so discuss options that would be safe for your child and that can still be enjoyed by everyone. A great way to ensure your child isn’t being left out is to offer to provide his or her treats or find out if there is an allergy-free version of the treat your child will be able to have. If you are sending your child with their own safe food, ensure the teacher or monitor knows this is the only food that you child can eat at the party. Deciding to allow your child to trick-or-treat should depend on how severe his or her allergies are. If you decide it’s safe enough to go door to door, always have a safety plan in place and have precautions ready. Let your child know before you even leave the house that he or she is not to eat any food until you’ve gotten home and had the chance to check all their candy. Setting the expectation before you head out is crucial for kids of all ages. Older children probably already have a good understanding of why this is necessary, but with a simple and appropriate explanation of the dangers, younger kids can be made to understand why they’ll need to contain their excitement about sampling treats while they’re out. Before Halloween arrives, consider alerting your neighbors to your child’s allergy. Ask them to not offer any foods to which your child is allergic and suggest they offer a toy, a little money or other non-food item. (You could even provide your neighbors with such items yourself.) Asking in advance allows your neighbors to be prepared. Once trick or treating is done, sort through the treats and find the safe ones and put them back into your child’s bag – then create a pile of definite no’s. You may have a third pile of “unsure” treats. You may need to do some research to determine if they are safe for your child, or if you feel it’s not worth the risk, simply remove them. Often, mini-bagged treats will have warnings on whether they were produced in facility that processes nuts or other allergens. Do not leave your child alone with his or her candy. Temptations can be too strong, and you may find your child digging in at the first opportunity. We’ve found that certain normally safe candies may be produced in different plants for the holiday version of the candy, and this may make them unsafe. This is why it’s so important to read labels on all potentially dangerous candies. If throwing out a lot of candy seems wasteful to you, one fun tradition we’ve heard of is to place all the unsafe candy in your young child’s trick-or-treat bag and place it on the porch overnight. They will get a visit from the “Great Pumpkin” who will exchange their unsafe candy for something they can enjoy. If your child suffers from severe allergies and trick-or-treating is just too dangerous, planning a fun party with some of their friends and having Halloween shows and crafts is a great option. Although candy is most associated with the holiday, it doesn’t have to be the most important thing. Kids will have just as much fun dressed up and playing as they do knocking on doors. You already know this, but we’ll say it again: You must always have your safety supplies ready whether your child is walking your neighborhood, at a school party, or at a friend’s house. If your child is prone to an anaphylactic shock always have an epinephrine auto-injector and other medications that your allergist has provided. If your child’s allergies are less severe, have sanitizing wipes available for contact allergies and any medications you give for minor allergic reactions. Other symptoms of anaphylaxis are dizziness and confusion. If you, your child, or another child around you begin to experience any of the above symptoms, use an autoinjector (if you have one) and call 911 immediately. You should also discuss with your child what to do if he or she starts feeling itchy, having trouble breathing or showing any signs of a reaction. Talk with your child in advance about what happens when an allergic reaction occurs and what treatment measures you may have to take. The more they are involved in their treatment, the more in control they will feel. If your child has contact allergies or suffers from hives or other skin issues, be aware of costumes and face and skin paint accessories that could lead to reactions. Most kids costumes are safe and hypo-allergenic, but some of the accessories may set off a reaction. Look out for nickel in some costume accessories such as cowboy belts, swords, tiaras and magic wands. Nickel is one of the most common causes of allergic contact dermatitis, which can make skin itch and ruin an otherwise fun night of trick-or-treating. Be on the lookout for ingredients in cheap Halloween makeup, which may cause allergic reactions. If your child must use makeup, opt for the higher-quality products. Don’t assume, however, that because it’s more expensive it’s safe – always test makeup ahead of time by applying a little bit to a small area of skin a few days in advance to check for a reaction. The Teal Pumpkin Project is a FARE campaign to help make Halloween safer for kids with allergies. Launched in 2014 the Teal Pumpkin Project aims to increase awareness of food allergies as well as promote inclusion for all of our trick-or-treaters. There are some great resources to show your support and even to add your house to a crowd sourced map of a list of homes that are participating—most Teal Pumpkin participants are offering treats other than candies. Do some pre-Halloween planning and keep a few tricks handy, and you and your goblins can be sure to have a safe and awesome Halloween! If you are worried that you or your child might have allergies or asthma – contact Allergy and Asthma Specialists of North Florida to schedule an appointment or to talk with one of our Board Certified Allergists. Most people in Florida look forward to autumn with its pumpkin spice lattes, mild sun and cooler air. But if you’re one of the estimated 40 million fall allergy sufferers in the U.S., this time of year can be very unpleasant. With the proper precautions and correct allergy treatments, you can enjoy all that autumn has to offer. While most people often associate allergies with spring and the pollen produced by flowering plants, fall can be the worst season to deal with allergies. As the weather here in Jacksonville cools, plants tend to release more pollen and the moist, cool air leads to increased mold growth on leaves and other surfaces. Combined, these factors can trigger severe allergic reactions. What are fall allergy symptoms? Fall allergy symptoms are not much different than what you would expect at other times of year. Most people refer to their symptoms as hay fever, while doctors refer to it as seasonal allergic rhinitis. Itchy, watery, and stinging eyes. Coughing and wheezing, potentially leading to asthma for sufferers. Life-threatening asthma attacks in extreme cases. What are the most common Florida fall allergens? Here in Florida, most fall allergies are caused by either weed pollen or mold spores. Because our weather provides for longer growing seasons, grass and mold pollen allergies tend to extend well into November. This is probably the number-one cause of fall allergies. Ragweed thrives all over the Central and Eastern United States, from far north to deep south. If you have hay fever symptoms in the fall, it’s almost certainly due to ragweed. Though ragweed starts to release it’s pollen with cool evenings and warm, humid days in August, it can continue well last into September through October. Approximately 75% of people who are have spring plant allergies are also allergic to ragweed. Additionally, ragweed pollen gets around. The amazing thing is that even if ragweed pollen isn’t common where you live, wind blown ragweed allergens can travel for hundreds of miles! It can grow as tall as five feet, with leaves that are arranged alternately and leaf blades that are long and have deep divisions in them. The flowers are not “showy” and result in small, green or yellow spikes. Fittingly named, giant ragweed can grow up to 15 feet high, with stems that have multiple branches and hairy leaves that grow opposite of each other (until you get high up the weed). The leaves are sandpaper-rough and rounded. Both types of ragweed release their pollen in late summer and continue to saturate the air through the first frost (which doesn’t happen often here in North Florida). One ragweed plant is capable of producing more than one billion grains of pollen per season. With proper weed control, you can get rid of the ragweed around your home. Remove any ragweed plants you find around your property and have your yard treated to kill weeds and control the pollen release near your home. Also do not wait to contact your allergy specialist to plan your allergy treatments. Allergy immunotherapy treatment involves administering small doses of an allergen to get your body used to it and induce long-term tolerance of the allergen. Mold is found wherever the weather is damp and cool. While we don’t have long-term cool weather, we do have a good amount of humidity, and the cooler fall air (which can dip into the 40s during the evening) can lead to an increase in mold growth for North Floridians. Molds grow especially well in decaying plant matter, such as leaves and grass clippings, as well as compost piles and rotting, wet wood. The first defense is to clear leaves and piles of plants that could invite mold growth, and fix or remove rotting wood. Don’t forget to look around your house (including inside) where dampness occurs and where mold growth may hide. According to our friends at the American Academy of Allergy, Asthma & Immunology (AAAAI), our weather plays a significant role in how bad mold allergies will be. Mold spores spread through the air similar to the way pollen allergens do, but there are two major differences: Mold spreads easily indoors and does not die off with a cold snap — it will just go dormant until temperatures are warm enough to bring it out of it’s dormancy. This means mold can reappear here in Jacksonville with the first early signs of spring in late February. This is another case where taking precautions can really help limit your and your family’s exposure to mold. First and foremost, clean up all dead and decaying plant material from around your house, rake up those leaves, get rid of rotting wood, clear your gutters of debris, and clean up compost and garden beds. Inside your house, consider investing in a good dehumidifier. Do your best to keep humidity levels low—below 50 percent is ideal within your house. In your garage and attic, make sure boxes aren’t damp and ensure insulation hasn’t gotten wet from the heavy rains we’ve been experiencing. Attics and garages can be a major incubator where mold can grow. If allergy symptoms hit, make sure to visit your allergist. Mold is a potent asthma trigger and you’ll want to have your inhalers ready and have your allergy and asthma management plan in place. If you’ve only recently developed allergies, your allergy specialist can test for your specific allergies to pollens and molds, which will help determine if you should start allergy shots. Immunotherapy is a proven method for controlling fall allergies. Smoke (from fall campfires)—Fall weather in Jacksonville makes for ideal s’mores roasting time and a small bonfire makes the early evenings a bit more cozy—but if the smoke from campfires results in an asthma attack, then it’s no fun at all. Since smoke is a common asthma trigger, always sit upwind of the smoke and keep your distance from the fire to prevent an asthma flare-up. Insect bites and stings—for insect allergy sufferers, certain bugs around your yard can be more than just a nuisance. An estimated two million Americans are allergic to insect stings, which can cause the life-threatening allergic reaction known as anaphylaxis. Anyone with an insect allergy should always carry an allergist prescribed epinephrine. Additional steps you can take to reduce insect stings is always wear shoes in the yard, keep food covered and not drinking from open soft drinks which attract bugs. Another thing you can do is hire a professional pest control company to treat for insects around your yard and home. Candy ingredients—Halloween is almost upon us and Thanksgiving is right behind, many of these holiday’s most popular foods—especially among children—can lead to dangerous allergic reactions for food allergy sufferers. Make sure to check food ingredients and let others know about yours or your children’s food allergies. When possible, stay inside and keep doors and windows closed when pollen is at it’s highest (usually in the morning or midday)—Like our Facebook Page to get daily pollen counts in our area or visit Pollen.com for your own local area. Before you turn on the heat in your house for the first time, make sure to clean the heating vents and change filters. Sometimes mold and other allergens get trapped in the vents over our humid summers and will fill the air in your house once the heat kicks on. Invest in a HEPA filter for your home’s HVAC system. These filters force air through a fine mesh and traps harmful allergens and particles such as pollen, pet dander, mites, and tobacco smoke. Use a dehumidifier to keep the air inside your home below 50% humidity. Wear a mask when working outside and in your yard so you don’t breathe in mold spores—this is especially important if you are raking leaves or picking up decaying grass clippings. With proper care and clean up, and some preventative medications, you can enjoy the great fall weather we have here in Jacksonville. Contact us to schedule an appointment for allergy screenings or to discuss an allergy management plan. It’s common for people with allergy symptoms to go directly to an ear, nose, and throat (ENT) doctor for treatment. ENT doctors are surgeons who are experts in resolving structural problems involving the head, face, sinuses, nose, throat and voice box. Allergist/immunologists are expert physicians who manage inflammatory (allergic) conditions of the nose, sinuses, ears, throat and lungs without surgery. Symptoms such as trouble breathing, sinus pressure, episodic ear discomfort, or a raspy voice can be caused by allergies and may not require surgery. If you’re wondering whether your symptoms require visiting an Allergist or ENT doctor, continue reading to help decide the right course of action for you. It’s back-to-school time again, and if you’re the parent of a child who suffers with allergies or asthma, it can also be a stressful time. Food allergies affect approximately one in 13 kids. That means that in the average classroom, there are about two students who are coping with some form of food allergy. Of these students, nearly 40 percent have a history of severe allergic reactions or anaphylaxis. Parents, teachers, and school officials need to be aware of the potentially life-threatening situations that can arise and be ready to handle them should they strike. Here, our board-certified allergists offer advice and resources for allergy- and asthma-sensitive kids and back-to-school preparedness. Request a meeting with the school nurse. Often, the nurse is the most experienced and best-trained staff member when it comes to medical emergencies. Your school’s nurse is the food allergy “champion” in your school, and the nurse should be your connection for developing a coordinated effort to ensure an all-inclusive approach to managing your child’s food allergy and asthma management in the school setting. This is why one of the first things we recommend parents to do is meet with the nurse and explain all of your child’s allergy or asthma symptoms. Speak to the school counselor to discuss whether a 504 Plan is appropriate. Under federal law, a food allergy may be considered a disability. In those instances your child may qualify for educational services under Section 504 of the Rehabilitation Act of 1973. 504 plans outline appropriate accommodations, aids or services that a student with a disability needs to be able to fully participate in a free and appropriate public education environment. A 504 plan allows you to create, in collaboration with your child and the school, a written management plan outlining how the school will your child’s food allergies. It will also allow your child to participate safely and equally alongside their peers in all normal facets of the school day. Disclaimer: We are not experts on 504 Plans—if you believe your child would qualify for a Section 504 Plan, please discuss this with your child’s counselor or the Special Education/504 Plan liaison at your student’s school. Share your emergency care plan. In conjunction with the nurse and teachers, share the emergency care plan you use for your family. Make sure all staff who works with your child is aware of this plan. This emergency care plan outlines the treatments recommended in case your child experiences an allergic reaction, the form is great for including emergency contact numbers and can be signed by your physician, pediatrician, and allergist. Share pictures of typical reactions your child has. If your child’s teacher has not cared for kids with severe allergies, it could be helpful to share pictures of what typical allergic reactions look like. If you have pictures of your student’s reactions that would probably be the best option, but even just directing staff to websites with allergic reaction pictures. Ask your child to describe to his/her teacher what they’re symptoms feel like. Children explain things in their own special way. They have a way of describing their experiences that are vastly different than the way adults describe things—and their way of describing allergic reactions are no exception. Knowing how a student experiences their reactions will help the adults around them save precious time when needing to recognize a reaction that is happening. Some kids, especially little kids, will place their hands to their mouth or pull and scratch their tongues in response to an allergic reaction. Additionally a children’s voice may change in response to a reaction (they may become hoarse or squeaky), and they could begin slurring their words. Speak with school lunch staff. Most schools have electronic systems for tracking lunch purchases. Ask that a notification or alert be included on your child’s profile. This notifies lunch personnel of your child’s allergy status and helps ensure he or she isn’t accidentally served foods he or she reacts to. In some instances, if your child has a very severe reaction to certain foods—especially if just being in close proximity to the food can cause a reaction—staff should be able to ensure a safe area in the lunch room or a safe eating area for your child. Keep an epinephrine injector at school. For parents in Florida, schools can keep non-student specific epinephrine pens stocked for children who suffer from anaphylactic reactions at school. However, every child with a severe food or insect venom allergy (i.e. to bees, wasps, fire ant, etc…) should have their own prescription for an auto injector that can be kept on hand at school. We recommend EpiPen, Auvi-Q or Adrenaclick (generic). You can also check out our patient education page for info on proper use of EpiPens. Use safety tattoos for notifying staff. You probably don’t need these for long-term use, but for the beginning of the school year (or other times when your child will be with new care providers), these safety tattoos can be extremely helpful in making sure people are aware of your child’s allergies. Have your child wear a medical alert bracelet. Especially for children at risk for severe allergic reactions, this is a better option than the safety tattoos. They are also helpful for EMTs who might respond in case of a medical emergency. Also, for your fashion-conscious kids, medical bracelets can be made like stylish jewelry. It’s common for classrooms to have snacks that may cause issues for your child. Create a safe food box that can be kept with the teacher to substitute for your child with severe allergic reactions. If safe food boxes are not encouraged, you can also offer up a safe food list for your child’s teacher to ensure that reactionary foods are not in the classroom. Ask for a list of birthday party dates. If your child’s classroom celebrates birthdays, it is possible to ask for celebration dates in advance and whether there will be dangerous treats available. Nowadays most treats have allergen-free alternatives that can be substituted for your child to ensure they don’t feel left out. This would give you a little more advance notice on events going on in the school and classroom. Also, volunteering in the PTA and on field trips can help you monitor your child (and other children that might have allergies). Additionally, many schools are in dire need of volunteers and assistance—so you’ll be helping your child and your community school. Ask school administrators to limit or not use your child’s classroom for after school activities. Sometimes schools have to use rooms for after-school activities or to support outside groups. Ask that your child’s room not be used for these activities. While there is no guarantee the administration can honor your request, it could help to limit allergens brought into your child’s classroom. Find out your school’s procedures for limiting allergens on buses and transportation vehicles. Determine if the policies and procedures are appropriate for your child. In some instances, you might be best served by transporting your child to and from school yourself. Most districts have a “no food” policy on their buses unless medically necessary (i.e., a diabetic child with low blood sugar). Some policies might include having an adult on the bus who is trained in administering epinephrine or ensuring special seating arrangements. Request advance notice of all field trips. This should be standard procedure for your school and student’s teacher, but don’t just assume they will give you a lot of notice for the field trips. Your child’s allergies needn’t prevent him or her from attending educational and fun field trips. But asking staff to provide you with as much advance notice as possible gives you a chance to prepare and address any allergy concerns. Ask to speak with the kids in your child’s class. Unfortunately, bullying occurs for all sorts of things, and kids with allergies aren’t immune to bullies. Ask your child’s teacher and principal if you can address your child’s class to help them understand what allergies are and what happens to your child if he or she has a reaction. This won’t prevent all bullying, but it’s a good way to address issues ahead of time. If speaking to the class isn’t possible, allow the teacher to address the class about your child’s allergies (without giving too much personal information). For younger classes, a great little video to share is Binky Goes Nuts — check with your child’s school or local public library to see if it’s available. Don’t forget to address recess, physical education classes, and sports. Recess is probably the most enjoyable part of the day for kids — but if your child suffers from allergies or asthma, it can be easily turn into the worst part of the day. For kids with allergic rhinitis (hay fever), parents can sign up for National Allergy Bureau pollen count alerts. When pollen count levels are expected to be high, you’ll be able to plan accordingly. If your child takes medication to control their symptoms you’ll be able to be ready for days when they’ll be highly affected. You may also ask your child’s teachers and school staff to do their best to keep windows closed to keep as much pollen out as possible. Children with exercise-induced bronchoconstriction or general asthma may find participating in physical activities difficult. However, it is very important for children to be active and participate with their classmates. Parents should work with the school staff determine the best strategies to keep your child as symptom-free as possible while allowing them to participate in recess and exercise. Sometimes it may be necessary to limit what sports and exercise kids can participate in to lessen the chances of triggering their symptoms and an attack. Another issue that can affect kids during playtimes and gym are insect bites. Insect bites can cause severe allergic reactions in kids with an insect allergy. Make sure the school nurse, school staff, and your children’s teachers are aware of their insect allergy and its symptoms and ensure your child always has an autoinjectable epinephrine at the school (or with them if allowable). Work with your child on how to self manage his or her allergies. Older kids need to learn how to manage their allergies and advocate for themselves. When you feel it’s age appropriate, make sure your child knows to carry their medicine at all times and how to self-administer epinephrine if appropriate. The good news for parents is that schools are becoming more aware of kids with severe food allergies and the actions to take to keep them safe. But it’s still important for you to be your child’s number-one advocate. Follow these tips to make sure you, your child and his or her school are ready for the coming school year! If you suspect your child has allergies or asthma and would like to have him or her tested for food allergies, contact us to schedule an appointment with one of our board-certified allergy and asthma specialists. We have four convenient allergy clinics in Jacksonville. With spring in full swing and summer on the way, we get to enjoy the benefits warmer weather and longer days. But with warmer weather comes allergies for many people. Even if you’ve never had allergies in the past, it’s possible to develop allergies as an adult. Adult-onset allergies, such as hay fever or food allergies, often appear in your twenties or thirties but can come on at any age. If you have dealt with a runny nose, scratchy throat, or continuous cold this spring, don’t count out spring allergies. Allergies develop when your immune system mistakes an otherwise harmless substance as a threat. Common allergens include pollen, animal dander, dust, mold, and food. When an allergen enters your body, your immune system cells release chemicals, such as histamines, which attack the allergen and cause allergy symptoms. Symptoms can range from mild to severe and in some cases, can cause anaphylaxis, a life-threatening allergic condition. Why Am I Getting Allergies Now? The exact reason for adult-onset allergies is hard to pinpoint as experts still don’t know exactly what triggers it. What we do know is allergies, such as allergic rhinitis (hay fever), are increasing rapidly in the U.S. and around the world. Another popular theory is the hygiene hypothesis which states a sanitary environment without exposure to bacteria increases the susceptibility to allergies. Sanity environments could be suppressing the natural development of our immune systems. With our homes and food being much cleaner than past generations, our immune systems may not be seeing the repertoire of environmental substances needed to develop a tolerance, so they overreact to allergens. If you had allergy symptoms as a baby or toddler (e.g., food allergy), they may fade during the teen years and return as an adult. However, this isn’t the case for all. Some people experience allergies for the first time as adults. As we age, our immune systems change too. Experiencing an illness, getting a pet, being pregnant, or moving to a new location with different allergens may launch an immune response and the development of allergies. While no one likes the idea of developing allergies late in life, there are plenty of ways to cope with them and treat them. First, see an allergist for proper diagnosis of an allergen and to discuss proper treatment options for the type of allergen. Management may include avoiding the allergen, taking antihistamines, or immunotherapy (allergy shots) which is a way to retrain your immune system to stop reacting to allergens. Some allergies, such as food allergies or insect venom allergies, can be more serious than others. Be sure to discuss with your allergist the best options for managing and treating your specific allergies. While allergies can be unpleasant no matter the age, the board certified allergists at the Allergy & Asthma Specialists of North Florida are here to help. Schedule an appointment today for allergy testing and to set up a treatment plan. The benefits of living in Florida are plentiful. Sunny days, beautiful plants, and warm temperatures are all a part of daily life in the sunshine state. The only downside to such a warm, welcoming climate are the allergies that many residents deal with throughout the year. Florida grasses, such as Bahia, Bermuda, and Johnson grasses, are significant allergy culprits in the spring and summer months. Long summers cause grasses to grow longer and produce pollen which results in prolonged exposure grass allergens. Grass pollen allergies typically cause itchy and watery eyes, a runny nose, scratchy throat, nasal congestion, fatigue, and even asthma attacks in severe cases. The symptoms can appear similar to colds and the flu that many may confuse allergy symptoms with a viral illness. While grass allergy season happens every year, it doesn’t mean you should be miserable. Use the following tips for dealing with grass allergies so you can enjoy life as normal this spring. Schedule an appointment with your allergist as soon as possible. Don’t try to tough it out. An allergist can recommend the most optimal medications or other allergy treatments such as immunotherapy (allergy shots) so you don’t have to suffer all summer long. Don’t wait until the symptoms start, schedule your appointment early. Download an allergy app or check the pollen forecast daily. On days with high pollen counts, enjoy indoor activities such as going to a movie or wandering around the mall. Warm days typically result in higher pollen counts. Damp or wet days hold pollen to the ground and are better days to enjoy the outdoors. Keep grasses in your yard short. The shorter your lawn is, the less pollen will likely be released into the air. Delegate yard work duties. If you suffer from grass allergies, mowing your lawn or doing yard work increases your pollen exposure. Delegate these tasks to another family member or hire a yard crew. If you must do the work yourself, wear an N95 protective mask and take an antihistamine beforehand. Change your clothes after being outside. Don’t risk bringing pollen indoors on your clothes and wash your clothes often. Clean your children and pets. Wash the clothes of babies and toddlers often to avoid inhaling pollen they pick up. Also, wipe down your pets and bath them often during the spring and summer to keep them from bringing pollen indoors. Dress children appropriately. If your child suffers from grass allergies and will be playing on the grass, dress them in cool but long pants and sleeves to avoid contact as much as possible. Avoid hanging clothes out to dry outside. While the fresh smell and economic benefits of hang drying your laundry may be preferred, it exposes your clean clothes to pollen. Dry your clothes indoors during the spring and summer months in the dryer or on a hanging rack. Keep the windows shut. A breeze is nice, but not on days with high pollen counts. Keep your home cool by closing blinds or drapes and using air conditioning. Clean the air in your home. To ensure you have clean air in your home each day, change your HVAC air filter every three months. It may also be beneficial to invest in a HEPA filter air purifier to reduce the allergens in your home. Don’t let spring and summer grass allergies get the best of you. Schedule an appointment with an allergist at the Allergy & Asthma Specialists of North Florida today.